5.5 grams of naturally occurring BCAAs in each serving. 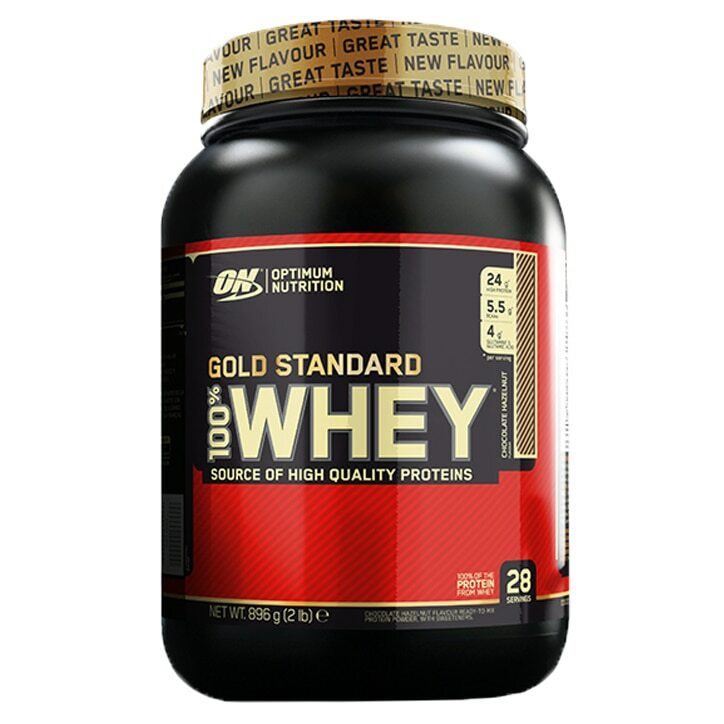 GOLD STANDARD 100% WHEY from OPTIMUM NUTRITION is the world’s best-selling whey protein. It delivers 24g of whey protein to support muscle growth*. After training, your body uses protein to help rebuild muscle fibres. GOLD STANDARD 100% WHEY is instantised for easy mixing. Simply add 1 heaped scoop (32 g) to 180-240 ml of cold water and blend, shake or stir until powder is completely dissolved. TIP: You can adjust flavour by using more or less water. Protein Blend (Whey Protein (MILK) Isolate, Whey Protein (MILK) Concentrate, Hydrolysed Whey Protein (MILK) Isolate, Emulsifier: SOY Lecithin), Flavourings (MILK), Fat-Reduced Cocoa Powder, Sodium Chloride, Sweeteners (Acesulfame K, Sucralose). Optimum Nutrition Gold Standard 100% Whey Powder Chocolate Hazelnut is rated 4.4 out of 5 by 17.